Summary: In The Yellow-Lighted Bookshop, Lewis Buzbee celebrates the unique experience of the bookstore—the smell and touch of books, the joy of getting lost in the deep canyons of shelves, and the silent community of readers. He shares his passion for books, which began with ordering through the Weekly Reader in grade school. Woven throughout is a fascinating historical account of the bookseller trade—from the great Alexandria library with an estimated one million papyrus scrolls to Sylvia Beach’s famous Paris bookstore, Shakespeare & Co., that led to the extraordinary effort to publish and sell James Joyce’s Ulysses. Review: A book about books. Why have i never read one of these before? I loved it. I loved seeing things i feel and experience, but have rarely taken the time to think about put down in words, analysed and expressed. This is aimed at anyone with a love of books, and i mean books—not just reading them, but their physical presence. 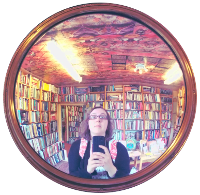 It explores the joy of bookshops, of slowly taking your time to look around and enjoy being surrounded by books, of picking them up and flicking through them, of simply spending time around them. It’s also a memoir of the author’s life around books. From working in local bookshops for many years, to becoming a sale rep and more, it’s obvious how much Buzbee loves books. As much as i loved books before i read this book, Buzbee’s love of them in infectious, and i definitely finished the book with an even higher appreciate and interest in them. The third aspect of the book is the history of books. On its own, this would have been very dry and uninspired, but the history is presented seamlessly amongst the love of books and Busbee’s life with books. It made the historical facts interesting and fun, like little stories of their own. My favourite was the Shakespeare & Co. bookshop in Paris, how it came about, how it stayed about, how it published and distributed Ulysses and how and why it eventually shut its doors. I think i would read a book entirely about that (is there one?). Ultimately, what made this book such an enjoyable read was Buzbee’s writing. His love of books shone through and you can’t help but get caught up in his enthusiasm. Reading this book was like being snuggled in a warm blanket. I didn’t want it to end.